On the weekly menu at my daughter's daycare is Mac & Cheese, prepared in the usual sumptuous way. Only that our daughter doesn't eat Mac & Cheese prepared this way, and when we tried preparing it at home for her, she took one look at it and turned her face away. Now i don't know why she does that to certain foods that you would bet children would love. We send food for my daughter almost daily since she is allergic to certain foods. Anyway I decided to try and do a twist on this dish, also keeping in mind that it had to be prepared in a jiffy in the morning before we leave for work. Here is the recipe for it, which has become a big hit with her, and she eats this unfailingly once every week. This serves one child (who may or may not consume the whole serving). 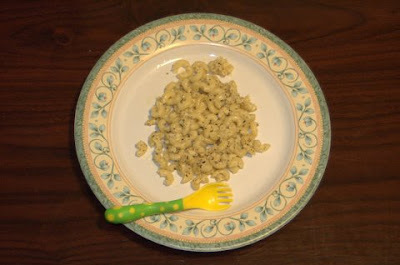 Boil the macaroni in water along with 1/2 tsp of salt, till the macaroni is cooked just a little more than Al Dente. Drain out the water and place the pasta aside in a container. Heat 2 1/2 tbsp olive oil in a pan. As the oil warms up, add crushed black pepper (just a few twists of the pepper corn mill). Add the oregano leaves as well. As the leaves turn slightly brown, add the cooked macaroni in the pan. Mix the pasta well with all the ingredients in the pan for about 10 seconds. At this point add all the Parmesan cheese while the stove is on, and immediately turn the heat off on the stove. Mix the cheese and the macaroni just until you see the cheese giving a hint of melting. Take the pan off the stove. This became very popular with my daughter and hence I started preparing similar dishes, keeping all the ingredients the same but replacing the macaroni with penne cut into biteable pieces; penne with a clove of finely chopped garlic added to the oil when it is heating up, to enhance the flavor of the garlic; penne with garlic and veggies (only one vegetable for each preparation) such as finely chopped zucchini, or broccoli, or sweet peas, etc. Its a very useful dish to pack and carry when you are going for any outing as it can be prepared very fast, its not messy when your child is eating it (the ones without the veggies), and very easy to carry as well. fizzkidz@gmail.com with your name and it will be posted.